Outboard catamarans were popular for a very short amount of time. Their heyday seemed to take place in the early mid 50's to the mid to late 60's. Many of the Cats you will find here were used in the racing world with great success. 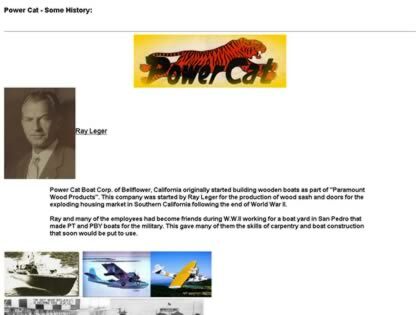 Web Site Snapshot: If available, above is a snapshot of the Power Cat - Some History web site at http://www.powercatboat.com/history/History.htm as it appeared when this site was added to the directory or last verified. Please Note that Boat Design Net has no involvement with the above web site; all content and images depicted in the above thumbnail are the property and copyright of Power Cat - Some History unless otherwise noted on that site. Description: Outboard catamarans were popular for a very short amount of time. Their heyday seemed to take place in the early mid 50's to the mid to late 60's. Many of the Cats you will find here were used in the racing world with great success.